K'tano, a charismatic leader, claims to be the former First Prime of Imhotep, a minor Goa'uld. Now a free Jaffa, having killed the Goa'uld he served as a false god, K'tano is gathering an army on Cal Mah, a planet of sanctuary for rebel Jaffa. Bra'tac and Teal'c believe that K'tano may represent the salvation they have been seeking, and they approach the SGC with a request for support. In a token gesture, SG-1 delivers food, supplies, and weapons to Cal Mah in the hope of forming an alliance with the growing rebel army against the Goa'uld. On Cal Mah, SG-1 finds a growing alliance of Jaffa, joining with former enemies in a common cause. However, their ways are different from those of Earth, and O'Neill is particularly troubled by the fanatical allegiance and indifference to death shown by K'tano's followers. His concerns are overlooked, however, especially by Teal'c, even when K'tano's army takes dangerous risks during a raid of Nirrti's planet. When a young follower blindly accepts a suicide mission through the gate, O'Neill fears that K'tano is amassing power for personal gain. 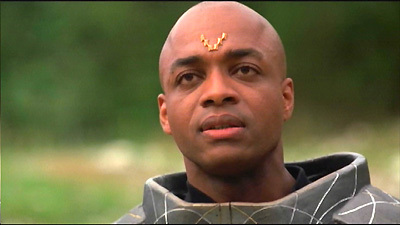 He withdraws his support of an alliance and prepares to leave, however Teal'c chooses to remain. K'tano plans to attack Lord Yu's homeworld, and Teal'c volunteers for the mission. However, Teal'c is captured, and Yu reveals a surprising truth to him before setting him free. Teal'c returns to Cal Mah with word that they have been deceived. He challenges K'tano in a battle to the death, and the truth is revealed. K'tano is really the Goa'uld Imhotep, who used his false identity to raise an army that could guarantee him true power. Teal'c is victorious, and Imhotep dies as Yu's mothership attacks from the air. The rebel army must escape through the stargate to continue their cause on another world. During the Third Dynasty of ancient Egypt, Imhotep was credited as being the first pyramid builder. He was later deified by the ancient Egyptians, but among the Goa’uld, he was never a System Lord, just an insignificant Goa’uld who had never achieved power of any kind. His Jaffa wore the symbol of a “V”. K’tano claimed to have been his First Prime. SG-1 was honored as slayers of Ra, Hathor, Setesh, Heru’ur, Sokar, Cronus, and Apophis. Ya duru arik kek onac. - I honor him who would kill his god. Kalach shal tek! - Victory or death! The P-90 carries a 50-round top-loading magazine of teflon-coated ordinance with a cyclical rate of fire of 900 rounds per minute, accurate within a range up to 350 yards. Peter DeLuise cameo: Voice in the warrior crowd, "An army has weapons! An army has food!" Do you have any idea what happened to the guys in that movie?